The sheer beauty and grandeur of the Kashmir Valley cannot be captured in plain words. Set at the foot of the awesome Himalayas, with the splendid Jhelum river meandering through it, this land of raw natural magnificence has enticed people from all over the world, for centuries. Aptly referred to as Paradise, Kashmir has been ruled by Emperor Ashoka, the Kushans, Gonondas, Guptas, Karkotas, Mughals, Afghans, Sikhs, and finally by the Dogras in the 19th century. Despite all these invasions, the Kashmiris have retained their traditions and innate simplicity. The major chunk of the population is Muslim, followed by Hindus, Sikhs, Buddhists and Christians. Kashmir is a land crisscrossed by umpteen lakes and rivers, each fascinating in its own way. The Jhelum or Vitasta, as it was called, is not only the bloodline, as it were, of the state, but also poses as the ethereal inspiration for many songs, legends, and poems. The other notable lakes include the Manasbal Lake, the Liddar river, the famous Dal lake, Nagin Lake and the Wular Lake, the largest in the state. Shalimar, Nasim Bagh, Nishat Bagh, and the legendary Chashme - e - Shahi are some of the delightful gardens, that are to be found here. Apart from its being the land of soaring snowclad mountains, sparkling waterfalls, shikaras (water taxis), impressive chinar trees, and vast fields of vibrant flowers, Kashmir is also renown for its unique handicrafts - papier-mache, woodwork, stone jewellery, fine Pashmina and Shahtush shawls, carpet weaving and silverware. The arts and crafts of this region are more than 500 years old, and bear a distinct Persian imprint. The valley is studded with several mosques and temples, built in diverse architectural styles. The Hazratbal Mosque, the holiest of all Muslim shrines, the stone temples of Avantipur, the cave at Amarnath, the most sacred Hindu shrine in the state, the great Shankaracharya temple, the Martand Temple all add to the kaleidoscopic appeal of Kashmir. Situated in the northern most part of India, Kashmir is bordered by Pakistan, China, and Afghanistan from West to East. From South to East, the boundary of the state touches Punjab and Himachal. The state can be divided into four major regions: the sub-mountain and semi-mountain plain known as kandi or dry belt, the Shivalik ranges, the high mountain zone constituting the Kashmir Valley, Pir Panchal range and its off-shoots including Doda, Poonch and Rajouri districts and part of Kathua and Udhampur districts, and the middle run of the Indus River comprising Leh and Kargil. 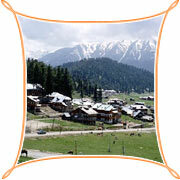 Kashmir possesses many specialized agricultural markets, retail shopping centres, and associated industries. The industries have developed from rural crafts and include handloom weaving of local silk, cotton, and wool, carpet weaving, wood carving, and leatherwork. Such industries, together with silverwork and copperwork and jewelry, were stimulated by the presence of the royal court and the tourist trade but also owe something to the important position achieved by Srinagar in west Himalayan trade. Although a small state, the climate of this state varies from one region to another. The climate of Jammu region is tropical while it is semi-arctic in Ladakh and temperate in Srinagar region. Accordingly, rainfall also varies from region to region and while there is almost no rainfall in Ladakh, Jammu receives a rainfall of above 1,100 mm and Srinagar around 650 mm. 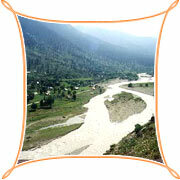 Accommodation is easily available in the hill resort of Kashmir. In fact you will find some suitable accommodation option within your budget. Delicious and hygienic food is also readily available in the hotels & restaurants. In Kashmir, besides Id other important muslim festivals are Urs at Khaneka in downtown Srinagar and Urs at Chrar-e-Sharif. The annual Ladakh festival is held in September; the Hemis Festival features chaams performed by the monks in elaborate masks. Jammu celebrates Lohri and Baisakhi in February. Every year a 3-day Jammu Crafts Mela is also organised during Baisakhi at the picturesque Mansar Lake, 60-km from Jammu. Bahu Mela, a major festival of Jammu region is held at the Kali temple in Bahu Fort, twice a year during March-April and September-October. Air : Kashmir is well connected by air with Delhi. Rail : Kashmir does not have a railway station and the nearest railhead is Jammu Tawi, which is 305 km from Kashmir.